Cut your yarn into pieces 2 required lengths + 1 or 2 centimeters. For example, if you want the hair to be about 10 cm long, cut the yarn into 22 cm pieces. Fold a piece pf yarn in half to form a loop. 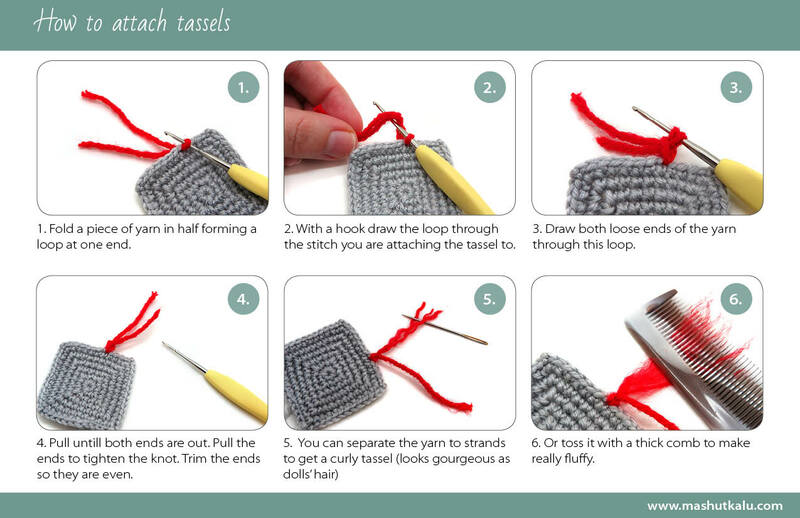 With a hook draw the loop through the stitch you are attaching the tassel to. Draw both loose ends through this stitch. Pull until both ends are completely out. Pull both ends to tighten the knot. You can trim the ends do the are even. If you find this tutorial useful download it as one file. Feel free to share!